Madame Speaker, I thank you for the opportunity to provide the Citizens of Trinidad and Tobago with a factual account of the Government’s successful procurement of two passenger fast ferries from the Australian shipbuilders, INCAT Australia Pty Limited (INCAT) and Austal Limited (Austal) and two Cape Class Patrol vessels from Austal for the Trinidad and Tobago Coast Guard. During the margins of the Caribbean Community (CARICOM) Leaders’ Meeting in July 2017 the Honourable Julie Bishop, M.P. who was then the Minister of Foreign Affairs of Australia invited me, as Prime Minister of Trinidad and Tobago, to visit Australia during the last quarter of 2017. However, due to conflicting work schedules I was unable to lead a delegation to Australia in 2017. 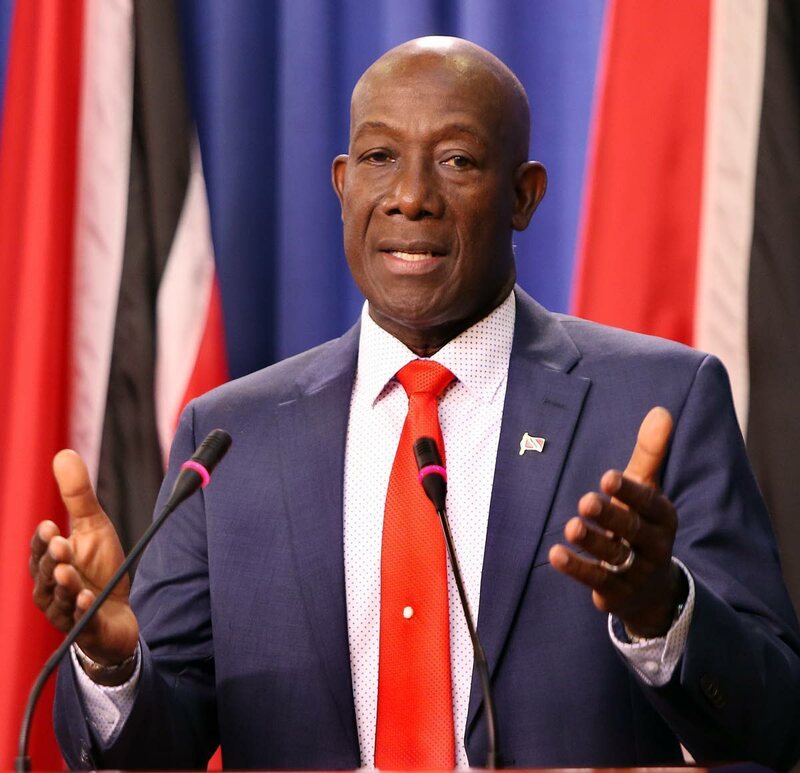 Madame Speaker, the population would undoubtedly recall that it was during 2017 that a number of issues arose with respect to the provision of the inter-island sea service between Trinidad and Tobago. By way of background, in 2006, Trinidad and Tobago, acquired two used fast ferries to service the sea bridge, the T&T Express and the T&T Spirit. By 2017, the T&T Express was 20 years old (having been built in 1997) and the T&T Spirit was 15 years old (having been built in 2002). Unfortunately, these vessels were not properly maintained during the period of 2010 – 2015 and, on many occasions, the vessels missed essential dry docking and maintenance servicing. Due to their age, wear and tear and the lack of proper maintenance the T&T Express and the T&T Spirit inevitably began having serious operational problems in 2016 that negatively affected their ability to sail and the sea-bridge was badly affected in 2017. As a result of these pressing issues the Government took a decision that it was time to replace our aged passenger ferries and to look into purchasing new fast ferries. This was also a priority at a time when the Government’s financial situation was extremely challenging. Two of the best international shipbuilders and in particular, fast ferry builders are INCAT and Austal from Australia with whom we already had developed commercial relationships. Furthermore, we in Trinidad and Tobago are very familiar with both INCAT and Austal vessels. Both the T&T Express and the T&T Spirit are INCAT fast ferries. The water taxis servicing the route between Port of Spain and San Fernando are Austal vessels. The Trinidad and Tobago Coast Guard has six fast patrol vessels that are Austal built. With this in mind Madame Speaker, having regard to the invitation of the Australian Government for me to visit Australia, I requested a bi-lateral meeting with the then Australian Prime Minister, the Honourable Malcom Turnbull, M.P., in the margins of the Commonwealth Heads of Government Meeting (CHOGM) in London in April 2018. At CHOGM, both Minister Dennis Moses, Minister of Foreign and CARICOM Affairs and I, met with the Australian Prime Minister Mr Turnbull and the Australian Minister of Foreign Affairs Ms Bishop in the margins. At this meeting I informed the Australian Prime Minister that the Government of Trinidad and Tobago was interested in procuring two new fast ferries, I also told him that we had an issue in securing our borders, via sea, and I asked whether there was anything that the Australian Government could do to assist Trinidad and Tobago in fixing these problems which were priority items in our country. Madame Speaker, right there and then the Australian Prime Minister agreed that Australia will do what it can to assist and for this Madam Speaker I want, on behalf of a grateful people of Trinidad and Tobago to thank the Government and people of Australia for coming to the aid of the people of Trinidad and Tobago. Prime Minister Turnbull informed me that his government had recently taken a decision to establish a specific billion dollar fund, a Defence Grant Fund, for the financing of the purchase of military equipment from Australia and that Austal built naval military/ defence vessels and a purchase of such vessels would qualify for funding under this new fund that he had established. The Australian Prime Minister invited me to have a “working visit” to Australia whereby visits could be made to both INCAT and Austal as well as a meeting with EFIC, the Australian government’s export credit agency. EFIC arranges financing for the purchase of Australian products for export, including marine vessels. Madame Speaker, the purchase of the four water taxis and the six fast patrol vessels from Austal were financed by a loan from EFIC. By Note Verbale no. P11/2018 dated May 4, 2018 from the Australian High Commission in Port of Spain, it was confirmed that there was an invitation for me, as Prime Minister, and a delegation to have a working visit to Australia and it was agreed that such a visit could take place for a week from May 20, 2018. By Cabinet Minute No. 744 of May 9, 2018, Cabinet agreed that I lead a delegation on an Official Visit to the People’s Republic of China from May 14 to 19, 2018 followed by a working visit to Australia from May 20 to 27, 2018. It was agreed that Minister Moses, Minister of Foreign and CARICOM Affairs and Minister in the Ministry of National Security and Minister Stuart Young, Minister in the Office of the Prime Minister and Minister in the Ministry of the Attorney General and Legal Affairs form part of the delegation accompanying me on this trip to China and Australia. Madame Speaker it was announced in May 2018 that I would be going to China and Australia and then during the course of the visits, on an almost daily basis, media releases were provided from the Office of the Prime Minister as to what meetings took place, with whom and a level of detail was given as to what was discussed. This has been a feature of my stewardship as Prime Minister, whenever I go on official overseas travel I insist that the Citizens of Trinidad and Tobago, are informed, via official media releases (which include photographs and sometimes video), what meetings I have attended, with whom and to discuss what. My visit to Australia was no different. During my working visit to Australia, the Foreign Affairs Ministry of Australia provided the Trinidad and Tobago delegation with official protocol and liaison officers who accompanied the delegation to every meeting that was held in Australia. The Australian government arranged for us to visit the shipyards of both INCAT and Austal and whilst there we met with the officials of each company. On May 21, 2018 the Trinidad and Tobago delegation visited the Austal shipyard in Perth and toured their facilities. During this visit we were able to see the construction of a fast ferry that was taking place and we were also able to tour a Cape Class Patrol vessel owned by the Australian Border Patrol. After the tour a presentation was made by Austal with respect to the type of fast ferry they would be able to build for our sea-bridge. They also presented on the Cape Class Patrol vessel and other facilities that they have. Discussion was held with Austal about their repairing the six fast patrol Trinidad and Tobago Coast Guard vessels and getting them serviceable. The possibility of a Public Private Partnership project to establish a ship servicing industry/ dockyard was also discussed. After our meeting with Austal, the Office of the Prime Minister put out a press release, along with photographs, indicating that the delegation had met with Austal. Madame Speaker, I lay a copy of this release on the table for the record. The release was titled, “Government Actively Looking for the Best Marine Vessels to Service Trinidad and Tobago”. How much clearer or how much more transparent could a government be than that Madame Speaker? Not only did we inform the public of who we met with, what we did and discussed but we also alerted the country to the fact that we were actively looking for the best marine vessels for Trinidad and Tobago. There was no secrecy. On May 23, 2018 the Trinidad and Tobago delegation travelled to Tasmania where we visited the INCAT shipyard. We were able to tour the construction of one of their state of the art fast ferries and their ship yard. The delegation, accompanied by the representatives of the Australian government, held discussions as to the type of vessel that could be built for Trinidad and Tobago. Of course Madame Speaker, it is to be recalled that the T&T Express and the T&T Spirit are INCAT fast ferries. Again, after this meeting with INCAT, the Office of the Prime Minister put out a media release along with photographs. I lay a copy of this release on the table for the record. This release was titled, “Prime Minister Meets with INCAT”. On May 24, 2018 I met with, amongst other people, the Prime Minister of Australia, Hon. Malcom Turnbull, M.P. There was also a meeting with the Prime Minister, the Minister of Foreign Affairs, Hon. Julie Bishop and the Minister of Trade, Hon. Steve Ciabo, and I was accompanied by Ministers Moses and Young. At this meeting we discussed the procurement of fast ferries and two Cape Class Patrol vessels and the financing of same using EFIC and our accessing the Defence Fund. A release was sent out by the Office of the Prime Minister on May 24, 2018 and again, I lay of copy of same on the table for the record. During the course of my working visit to Australia, we also met with officials from EFIC and discussed Trinidad and Tobago’s interest in procuring two passenger fast ferries and two Cape Class Patrol vessels for the Coast Guard. EFIC officials said that Trinidad and Tobago’s credit rating was very good as we had always serviced our existing credit facilities with EFIC. Upon my return to Trinidad Madame Speaker I held a press conference and informed the public of the details of the visits to China and Australia and I did state that we had visited both Austal and INCAT and we would be inviting them to make competitive proposals for the supply of new fast ferries and that we were interested in Cape Class vessels to strengthen our border security. The Government invited both INCAT and Austal to make proposals for the supply of fast ferries and Austal was invited to make a proposal for the supply of military vessels. Both companies provided their competing proposals. During the period June 24, 2018 to July 1, 2018, a two member delegation from the Trinidad and Tobago Defence Force (TTDF) visited Australia on behalf of the Government. The delegation comprised, Rear Admiral Hayden Pritchard, Chief of Defence Staff and Lieutenant Commander Rajesh Boodoo Engineering Officer of the Trinidad and Tobago Coast Guard (TTCG). The purpose of their visit was to conduct an assessment of Austal’s Cape Class Patrol Boat and to determine its suitability for use by the TTCG. Focus was also placed upon the vessel’s sustainable and cost-effective maintenance which would bring forth optimum utilisation. The TTDF produced a report dated July 3, 2018 on the Cape Class Patrol vessels and found that the vessel “would be quite appropriate for operation within the TTCG.” It was recommended that two Cape Class Patrol vessels should be acquired as they could contribute significantly to, and enhance the TTCG’s operations. Mr Demi-John Cruickshank, Tobago Businessman. INCAT and Austal representatives presented their proposals to this Cabinet appointed evaluation committee on July 11, 2018 and the committee met on July 13, 2018 to evaluate the proposals. The committee also utilised the expertise of Chief Engineer, Mr Isikeli Waqa from UTT in the evaluation process. The TTDF interrogated Austal with respect to the military vessels. The Committee compared the technical specifications, capacity and cost and found that both Austal and INCAT proposed solutions capable of adequately meeting the needs of the Government. The Austal proposal was for a 100m vessel and the INCAT proposal was for a 94m vessel. that the Government would pursue financing arrangements with EFIC, Australia and financing from the Government of Australia to fund the two (2) Naval Cape Class patrol boats. It was also agreed that the purchase of the two fast ferries should be done by NIDCO. Madame Speaker, NIDCO proceeded to retain the services and expertise of the international law firm, Haynes and Boone CDG, LLP of London, United Kingdom to provide it with legal support to negotiate with both Austal and INCAT for the purchase of the vessels. Marvin Gonzales, Director Legal Services, MOWT. Mr Andreas Silcher, partner at Haynes and Boone, CDG, LLP of London, UK provided legal support during the negotiations with Austal and INCAT. Over the three day period this Committee discussed several issues inclusive of clarifying the technical, operational and maintenance requirements, risk assessment including financial risks, commercial issues surrounding the price proposals, proposed delivery dates and other contractual issues. purchase from INCAT, a 100m high speed passenger/ cargo roll-on/ roll-off catamaran ferry with a capacity of approximately 1,000 persons inclusive of 224 VIP seats, 239 cars with accommodation for trucks and a prisoner holding cell for up to 10 persons. The speed of the vessel would be 39.5 knots. The cost of this vessel was estimated at US$72,977,000.00. the engagement of INCAT to to design, build for and deliver to NIDCO a 100m high speed passenger/ cargo roll-on/ roll-off catamaran ferry at the estimated cost of US$72,977,000.00 inclusive of Booking Fees. Madame Speaker, NIDCO and the Ministry of National Security have proceeded to order the two fast ferries and the two Cape Class Patrol vessels and the contracts for the purchase of these vessels have been executed and monies paid in accordance with the material contractual arrangements. As at January 7, 2019 NIDCO paid Austal the sum of US$8,148,000.00 with US$7,148,000.00 being the 10% down payment for the fast ferry and US$1,000,000.00 being the scheduled acceleration payment. Likewise, as at January 7, 2019, NIDCO paid INCAT the sum of US$15,595,400.00 with US$14,595,400.00 being the 20% down payment for the fast ferry and US$1,000,000.00 being the booking fee. Only today a further sum of US$5,361,000.00 has been paid to Austal for the ordering of the engines for the fast ferries. The Government is pursuing financing arrangements with EFIC for these marine vessels. Madame Speaker, as is to be expected, there are further sums which will become due under the contractual arrangements going forward until the completion of the vessels. These are the details and chronology of how the two fast ferries and the two Cape Class Patrol vessels were procured for the people of Trinidad and Tobago. As is evident, at every step of the way, this Government has been transparent in how it has conducted itself. There have been several levels of evaluation and negotiations with INCAT and Austal, and at every step of the way, the Government has informed the public of its actions and decisions, unlike what transpired between 2010 and 2015. The Government between 2010 and 2015 did not inform the public that it was procuring vessels for the TTCG from Damen. There was no transparency in the procuring of the vessels from Damen and in fact, financing was not even properly in place for the payment for the vessels ordered from Damen. It fell to this Government to arrange financing and payment for these vessels after they were delivered and we were never even told were ordered until they arrived in Trinidad and Tobago. Worse yet, Madame Speaker, was the procurement of CG60, the Chinese vessel purchased for the TTCG. There was no proper evaluation as to the suitability of the vessel for the TTCG and there was no financing in place for the payment for the vessel. As far, as we are aware, the Chinese vessel was procured by the former Prime Minister on a whim, seeing a vessel in China and declaring that she “wanted one like that”. It also fell to this Government to determine financing arrangements and to complete negotiations and pay for this vessel AFTER it was delivered to us here. So Madame Speaker, to have the Opposition questioning the procurement of the two ordered fast ferries and the two Cape Class Patrol vessels from INCAT and Austal and to have them bringing the Country into disrepute by writing to the Attorney General of Australia making completely unfounded and spurious allegations is quite difficult to swallow knowing fully well how they conducted themselves before. The procurement process used by the Government in the present circumstances can withstand all scrutiny and is untainted. It is the view of this Government and should also be a concern to all our citizens that there are persons in and out of office in Trinidad and Tobago who would sully the country’s image and its name purely for personal political advantage here in Trinidad and Tobago. This Government condemns the invitation to the Australian Opposition to oppose this assistance by their Government and the UNC’s approach to the Attorney General’s office in Australia, in their futile attempt to embroil the Government of Australia and people of Trinidad and Tobago in a contrived fabricated “scandal” without a shred of information or evidence to support such misconduct. Madame Speaker the level of transparency associated with this watershed business relationship between Australia and Trinidad and Tobago is largely unknown in the conduct of public business in our country and should be viewed as a template for future dealings. As such this Government is proud of our diplomatic success which has resulted in the benefits I have outlined here today and once again I wish to thank the Government and people of Australia for their outstanding support and recognition of Trinidad and Tobago as a valuable trade and business partner in the Commonwealth of Nations. Reply to "Full statement from PM on TT procurement of vessels"